Sextans, the part of the sky covered by the new map. How do we find a tiny shred of self-understanding in this vast universe? More simply: how did we get here? A proper map could help us answer this question. And a map scientists are making. 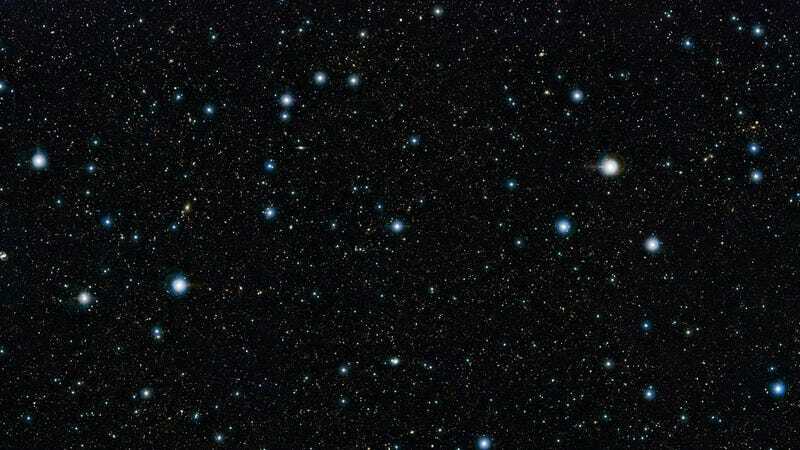 A team of researchers in Portugal, the United Kingdom, the Netherlands, and the United States have presented a new map that records galaxies deep into the distance of a small swath of sky. They revealed a sample of 4,000 galaxies. Here’s an image of their map, below. Each of the galaxies is plotted by its redshift, meaning how fast it is receding away from us—more distant light appears redder to us because its wavelength has been stretched by the expansion of the universe. The closest galaxies are in blue, since blue has a shorter wavelength. Even though the universe is only 13.8 billion years old, you’ll notice that the light has traveled billions of light-years more than that—another effect of our expanding universe. The map, from nearer (blue) to farther (red) galaxies. This survey specifically uses the COSMOS field, perhaps one of the most widely studied areas in the sky outside of the Milky Way, according to the paper published in the Monthly Notices of the Royal Astronomical Society. This data included observations from x-ray, ultraviolet, infrared, optical, and radio waves. Specifically, the study looks at the “Lyman alpha line”—light emitted when an electron in hydrogen atoms jumps from an excited state to a ground state. This light is usually the ultraviolet kind, much of which can’t be detected on Earth since our ozone layer blocks most of it. But the expanding universe stretches the light so it becomes visible to ground-based telescopes, like the Subaru telescope in Hawaii. By looking at it through different filters, they can spot galaxies of specific wavelengths, and therefore specific ages. The team’s analysis reveals 4,000 of these Lyman-alpha emitters—that’s 4,000 potential galaxies around 19 billion to 28 billion light-years away. The team’s still doing spectroscopy (seeing what other colors the galaxies emit to see what elements they contain) and how they are moving. But ultimately, tools like these could be plenty useful to astronomers to try and understand how galaxies like ours evolve over time. The astronomers also see changes in the light emitted between these galaxies, implying changes in how active they are. Additionally, the galaxies are much more compact than our own, implying that our galaxy, too, could have once been much smaller. Bright x-ray emitting galaxies in the data, called active galactic nuclei, could also help astronomers understand how density varies throughout the universe. The data is now public. So maybe you can take a look and try to understand how galaxies evolved over time, and perhaps one day we will figure out how our own got here.